This morning the FDA unveiled the new Nutrition Facts label. There are many important changes, updates that modernize the Nutrition Facts label with our current eating habits. One of the biggest changes, actively opposed by the food industry, is the addition of "added sugars" to the label. Also, the nutrients of concern have changed, with Vitamin D and Potassium now mandated to be on the label along with Calcium and Iron. Some serving sizes will also be changing. Now packages that are clearly meant to be consumed in one sitting will need to be represented as one serving. For example, a 20 ounce soda bottle will now be represented as one serving, whereas before it often said 2.5 servings (and the serving size was 8 ounces). Eliminating the mystery behind the food we consume allows us to make smarter - and healthier - choices for our families. Find detailed information on all of the changes at the FDA website. Here is the press release from the White House. Businesses will need to implement the new label on all packages by July 26, 2018. Hudson Valley Seed's Vegetable of the Month for March is cabbage. I'm not letting the fact that it is the very last day of March deter me from posting a short blurb celebrating cabbage. Whenever possible, I try to volunteer on the day the school is holding the taste test. This month it was a big thumbs up for cabbage and I'm always impressed with how many kids are willing to try it. Granted the recipe this month was Irish potatoes and cabbage - heavy on the potato and seasoned with a little turkey bacon - but it still gave us the opportunity to talk a lot about cabbage. Did you know that one cup of cabbage has only 15 calories? Or that cabbage is high in fiber, Vitamin C and Vitamin K? Plus it is inexpensive, very versatile and delicious. That last recipe, by Mario Batali, takes a little bit of effort but is completely worth it. An effortless way to incorporate more cabbage into your meals is to chop it into slivers and serve it raw under stewed chicken or a heap of it in your fish taco. The 2015 Dietary Guidelines for Americans are finally here. The Dietary Guidelines for Americans are released every five years. These guidelines are written mostly for policymakers and health professionals. But it becomes a foundational document for nutrition guidelines implemented at schools, for example, and guidance for clinicians, and therefore should be of interest to everyone. Perhaps more embattled than any other release, the consensus on these new guidelines seems to be that not much has changed since their previous release in 2010. Here is the link to the updated guidelines: 2015 Dietary Guidelines for Americans. This lengthy document also offers a snapshot of our current diet as a population, in addition to advising on where it should be going. It conveys this information in as many charts and infographics as possible. The chart to the right shows the sources of added sugar in our diet per food category. 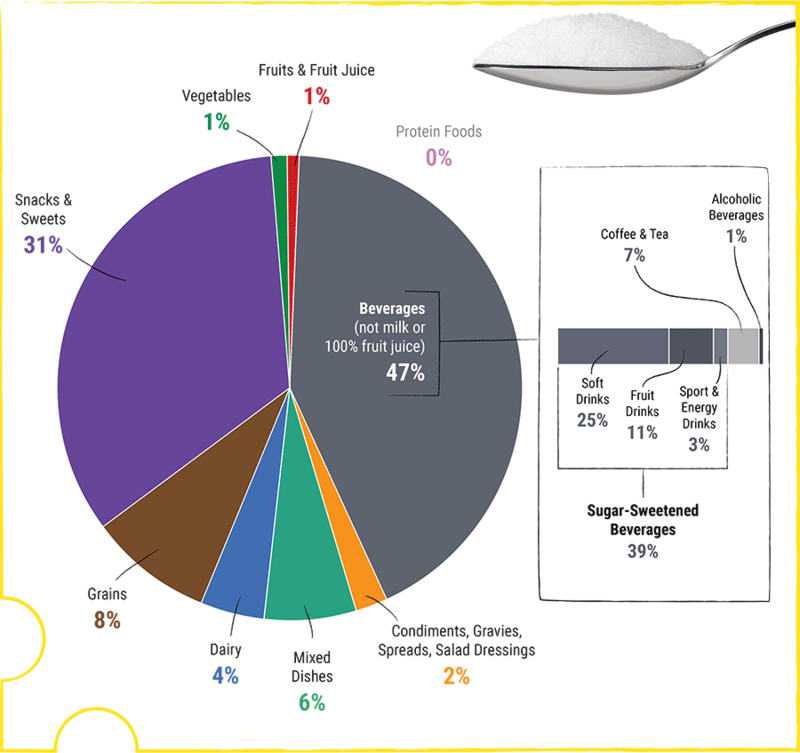 No surprise that 47% of added sugars come from the Beverages category, with 39% from sodas, sugary fruit drinks (which does not include 100% fruit juice), and sports drinks. This amounts to more added sugars from the beverages we drink than from desserts (Snacks and Sweets on the chart).